a standard form of musical composition consisting of a simple usually harmonized melody presented first in its original unadorned form then repeated several or many times with varied treatment so based on the theme that at least some semblance of its general melodic or harmonic form is evident. Mozart, Beethoven, Schubert, Chopin, Brahms and many, many other composers, of all types and styles of music, have use the "theme and variations" form ... taking one basic melody, and then creating variations of that original to fashion something a bit different. No. This week's blog is not about music. As usual, it's related to crochet. It's just that when I started thinking about a unifying idea for this post, "theme and variations" was the first thing that popped into my mind. That's because the creations I wanted to share with you are all variations on two initial forms. 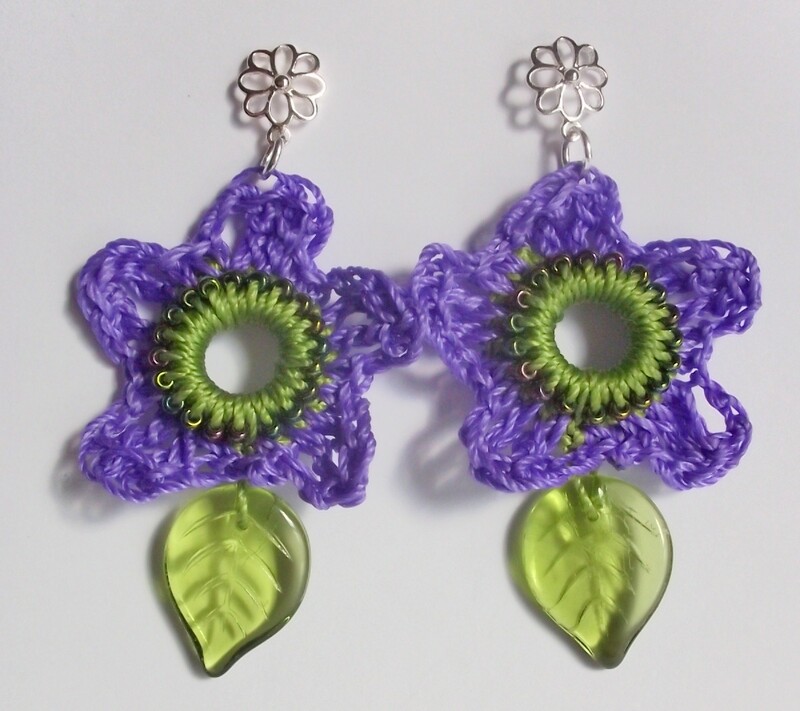 I created three new pairs of earrings, all of which are variations of the crocheted Spring Flower Earrings pattern that I shared last year, and I created four new headbands, all inspired by a free basic headband pattern by Jaime Maraia on the Crochet Dynamite blog. 1) Apricot Flower Earrings - For this pair I did not add beads to the center of the flowers. Instead I moved them to the petals, which are done in two rows -- one through the back loops only of the single crochets around the center ring, and one through the front loops. The petals were formed simply by making loops of chain stitches, attached at each single crochet with a slip stitch. I added a tiny glass seed bead to every other chain stitch. Apricot Flower Earrings - Notice I used antique silver charm leaves, rather than glass leaves in this variation. Apricot Flower Earrings - This view gives you a closer look at the petal construction. This pair of earrings is currently for sale at the Yellow Door Art Market in Berkley, Michigan. 2) Tranquil Borders Earrings - These crocheted earrings were a bit more of a "variation" from the original Spring Flowers earrings design. I used a combination of 30 gauge Artistic Wire and C-Lon cord and after making the beaded single crochets around the center ring, I worked a square motif in the back loops only of those single crochets, followed by petals formed of chain stitches slip stitched to the front loops. Tranquil Borders Earrings - I made my own little glass leaf "dangles" to add to the base of each earring. Tranquil Borders Earrings - The addition of the wire was necessary to help the squares (turned to look like diamonds) keep their shape, plus it gives them an interesting look and texture. Tranquil Borders Earrings - These earrings are also currently for sale at Yellow Door Art Market. 3) Fiesta Floral Crocheted Earrings - This final "variation" is sort of a combination of the first two -- I used the wire and fiber combination again, and the square motif, but then for the flower in front, I used the beaded, chain loop petals as seen in the Apricot Flower Earrings. Fiesta Floral Crocheted Earrings - For this pair I used variegated crochet cotton instead of C-lon cord. Fiesta Floral Crocheted Earrings - Notice I used antique copper posts on this pair. I like the look of the copper with these colors. Fiesta Floral Earrings - This pair of earrings is listed for sale in my Gossamer Tangles Etsy store. Yes, I finally have it back up and running, and I am continuing to add inventory. Now for the headbands! I saw a simple and very cute, and free pattern for a Basic Striped Headband on Crochet Dynamite's Blog (a fabulous blog for crocheters!!) and thought I would like to try it. If you look at the pattern, you will see that it uses a length of elastic between the two ends of the crocheted band, to secure the fit, and a chain stitch is worked over the crocheted band after it is finished, creating two stripes. I never did make one exactly as the pattern specified, but these are the variations I came up with. 1) Crocheted Beach Colors Headband- This was the first headband I made. I basically used the pattern to create the band (although I had to vary the hook size and number of stitches because I used a heavier cotton-based yarn). 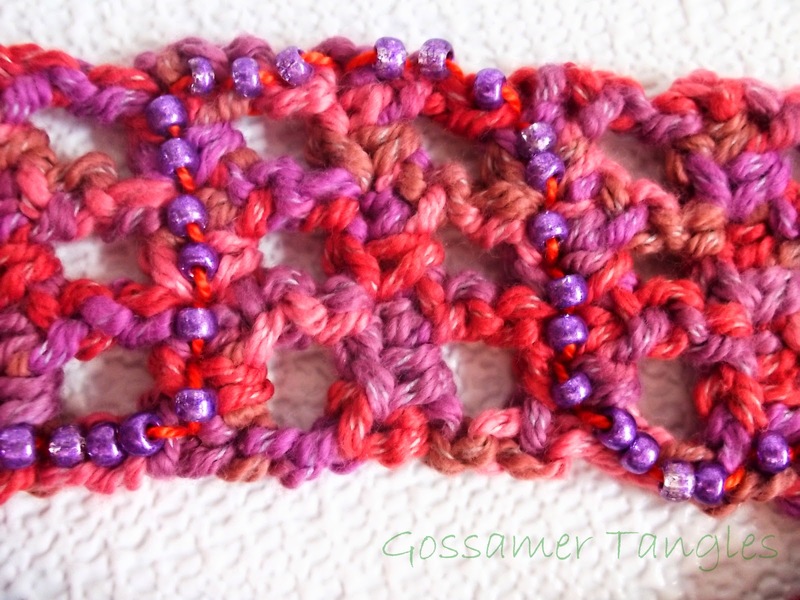 Instead of chain-stitching stripes on the completed crocheted band, I made a beaded crocheted chain, securing it with slip stitches to the edge of the band in a zig-zag pattern as I crocheted the chain. Crocheted Beach Colors Headband - This is a very comfortable headband and it stays in place. It is listed for sale in my Gossamer Tangles Etsy store. 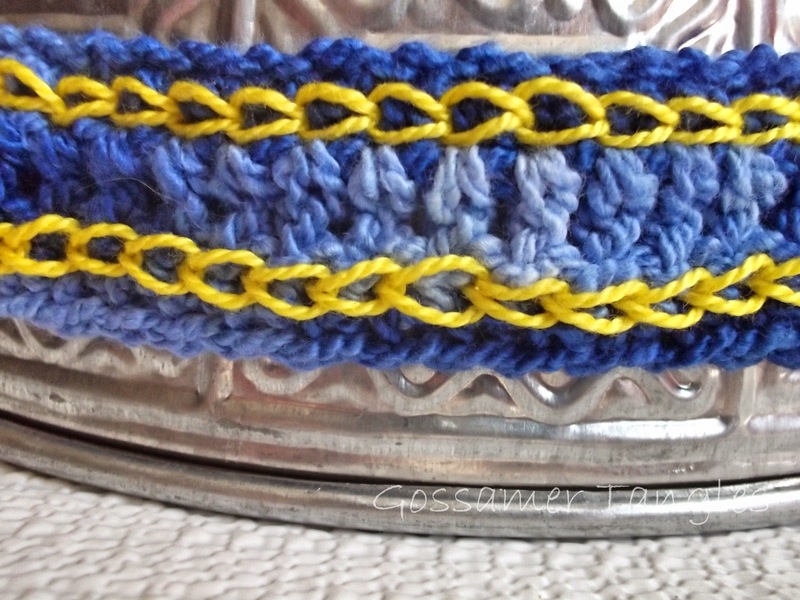 Crocheted Beach Colors Headband - This is a closeup of the zig-zag chain worked across the body of the band, with a bead worked into every other stitch. Crocheted Beach Colors Headband - Rather than using a length of elastic to complete the circle, I secured two elastic pony tail holders together and then folded the ends of the band through each loop and stitched the end to the body of the band, around the elastic cord. 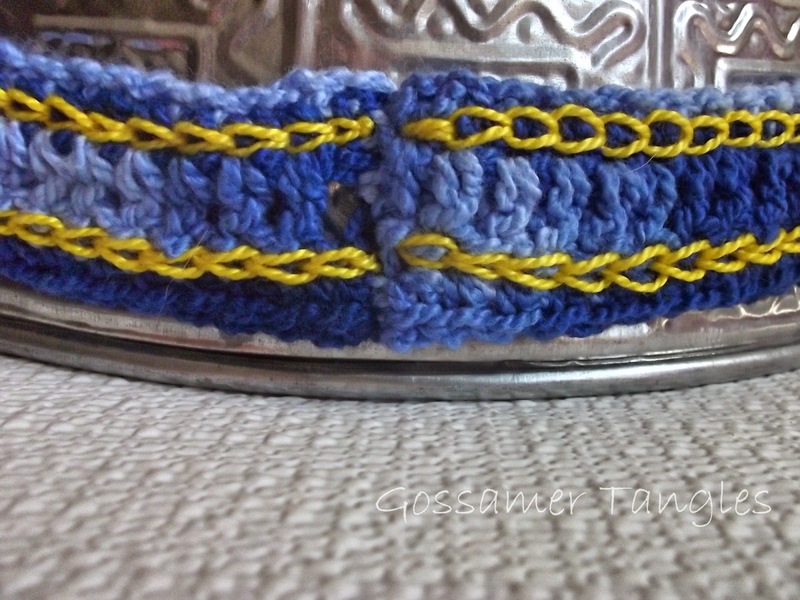 2) Michigan Blues Crocheted Headband - One variation for this headband involved replacing the row of single and half-double crochets worked in the center of the band with a center row of double crochets. I used sunny yellow to work the chain-stitch stripes, remind me of sunny Michigan skies in the summer and my alma mater, the University of Michigan (Go Blue!). Michigan Blues Crocheted Headband - At the Yellow Door Art Market. 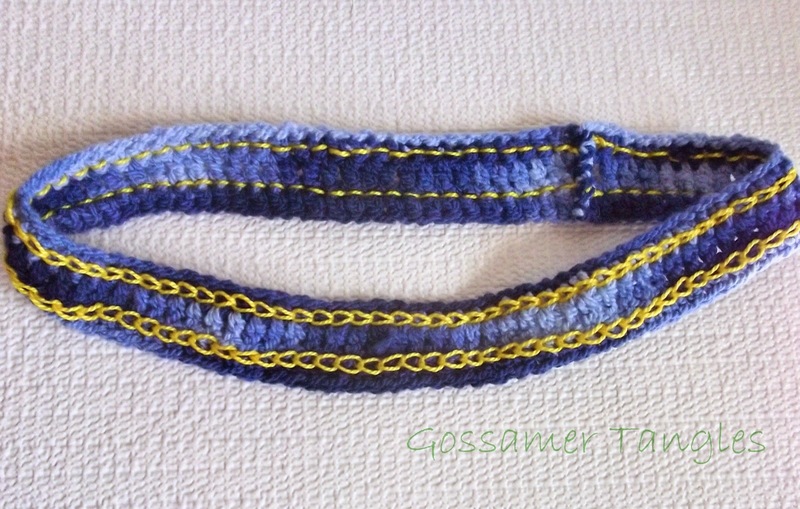 Michigan Blues Crocheted Headband - I used perle cotton embroidery thread to do the chain stitching. Michigan Blues Crocheted Headband - The yarn I used, Cascade Yarns Fixation, is stretchy, and therefore, no elastic insert was needed. I just sewed the two ends of the band together. 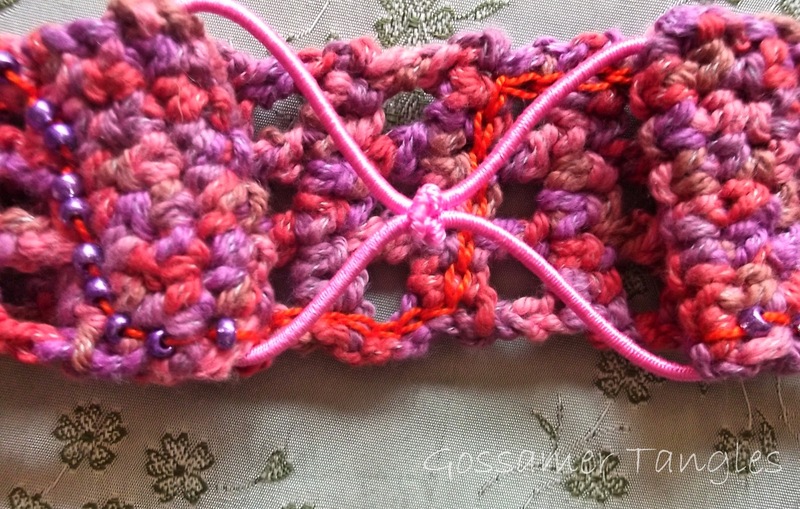 3) Sunset Skies Crocheted Headband - With this design I went off in a whole new direction with my variation. I continued to use a cotton-based yarn, but decided to crochet in a different type of stitch pattern, going width-wise, instead of length-wise. I used the chain stitch, but in reverse, so that the chain shows up on the back of the headband, and I essentially have a straight stitch securing the bead in the pattern I added to the front. Sunset Skies Crocheted Headband - You can see that this trellis-type stitch pattern is much more open that the bands that were worked length-wise. Sunset Skies Crocheted Headband - I used the same type of closing for the headband that I used on the Beach Colors headband. Sunset Skies Crocheted Headband - This headband is also available at Yellow Door Art Market. 4) Taupe Metallic Crocheted Headband - This headband variation is a bit more delicate looking. It was worked in a crochet cotton, rather than cotton yarn and, as a result, a smaller hook was used. 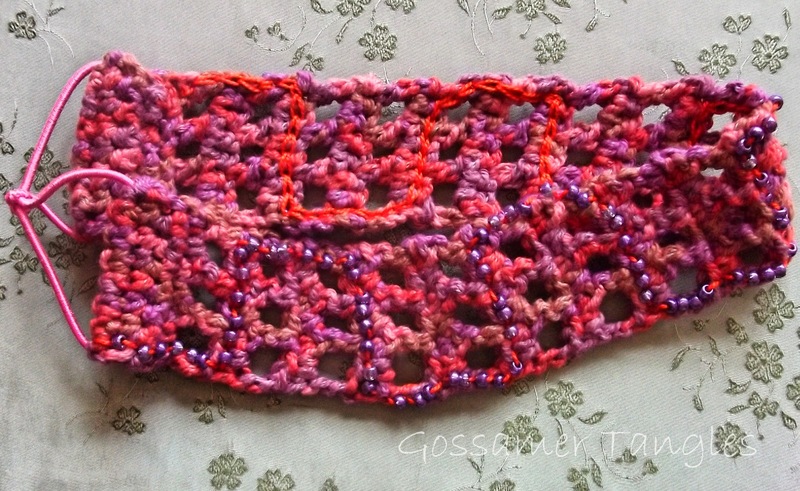 Like Sunset Skies, the stitch pattern is horizontal and more open. It has just a touch of glitz from the metallic strand in the thread. Taupe Metallic Crocheted Headband - The pattern has the appearance of chain-linked rectangles. Taupe Metallic Crocheted Headband - Same type of elastic band closure. Taupe Metallic Crocheted Headband - This headband is for sale in my newly revived Etsy Store . I can see why "theme and variations" became such a popular musical form. It is fun to take one thing, play with it, change it, and turn it into something new. It's sort of an organized way to experiment! I hope you will give it a try and stretch your imagination.